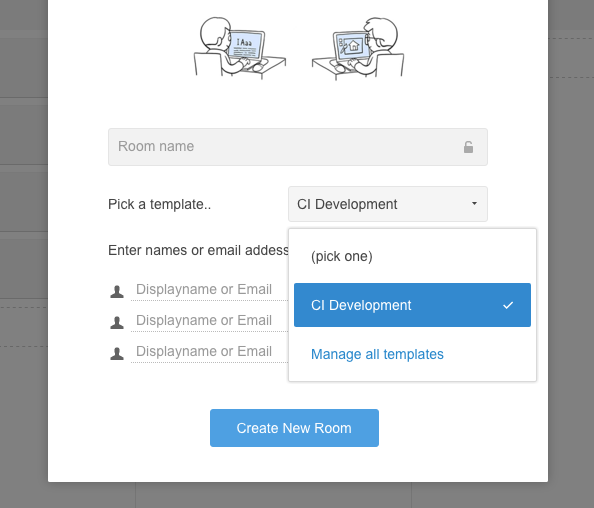 Room templates serve as the basis for creating rooms when processes and projects exist that have a similar workflow or structure. 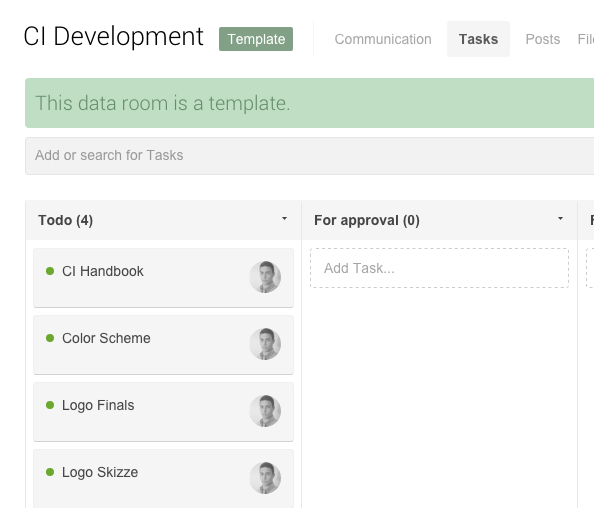 For example, you can create tasks, files or posts within a room template and use these each time a similar project needs to be done. How do I create a room template? Use the "Quick Add" button to create a room template. New room templates can be created by clicking on the "Quick Add" button. This will open a drop down menu, which contains the option "New Room Template...". Clicking on that will open a new pop up menu, in which you can define a name for the room template. In addition, you can define if the room template should be stored encrypted or unencrypted. This decision only applies for the room template itself. When creating a room from a room template, you can still decide if the actual room should be encrypted or not. 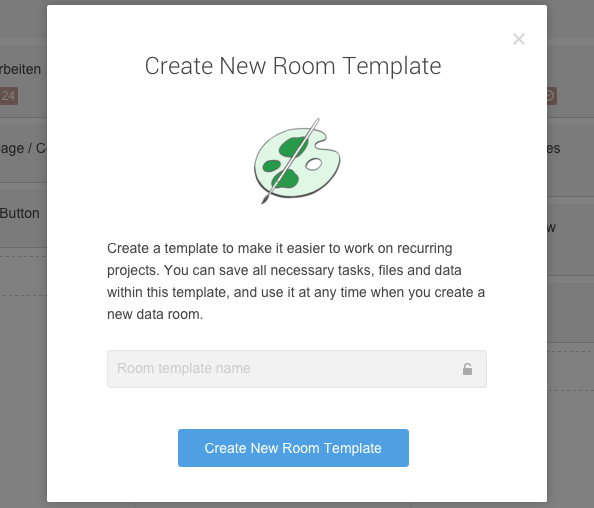 Finally, the room template is created by clicking on "Create New Room Template". Define a name and activate / deactivate the encryption. How do I edit a room template? After creating a room template, it will be displayed directly. 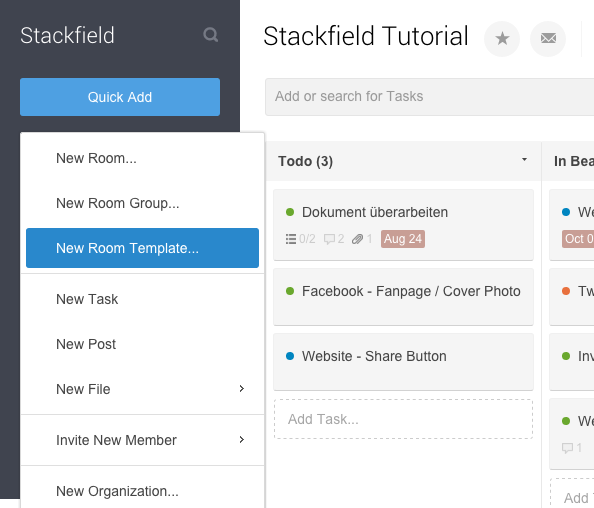 Within this template, you can now create all tasks, files etc. that you need. You can also add users to the template. Later, these users will be automatically added to rooms, which are created through room templates. You can access all room templates through the search, which can be opened by clicking on the search-button (magnifying glass) in the upper left corner or by pressing "ctrl" + "k", where you only need to click on "Room Templates" at the bottom of the window. A template can be opened and edited through the dashboard. How do I use a room template? Room templates can be used each time you create a new room. Simply click on "Create from template.." and select a room template within the dropdown menu. After having clicked on "Create New Room", your new data room will be created with all items that are contained in the template. Choose the needed template while creating a room.